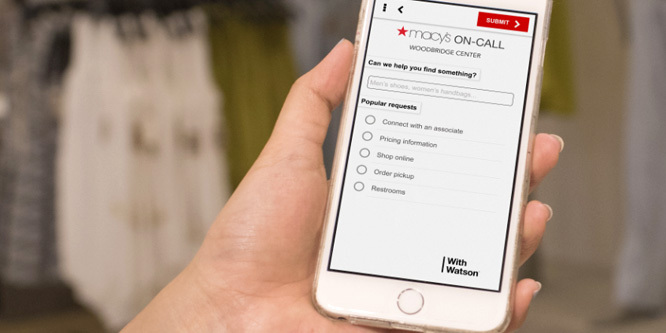 Macy's is testing a mobile tool using artificial intelligence that lets shoppers get answers customized to the store they're in — like where a particular brand is located or what's in stock — that they would normally ask a sales associate face-to-face. The tool, which the nation's largest department store chain calls a "mobile companion," can be accessed for now through a browser and will accept questions in 10 U.S. locations about products, services and facilities. It uses natural language and offers feedback in seconds. It's developed by IBM Watson — the Jeopardy-winning "cognitive computing" service and is designed to keep learning more about the store's customers. That's a key element as Macy's seeks to spur sluggish sales, make being at the store more enjoyable and distinguish itself from online portals and specialty retailers.